When I walked into the Social Welfare office to give training on Microsoft Excel (as I usually attempted every week), I was confronted by a pile of boxes next to the door. These didn’t seem like anything special at first glance. They were stacked tightly, with the odd computer printer box mixed in for a splash of diversity. There are many departments that have things in there office, waiting to be handed out. Youth Employment has had bicycles and hair dryers. Community Development has had large bags of Ionized Salt. So, I went to take my seat, not thinking too much of them. The boxes themselves were very plain. Crumbled and stamped with basic text. They read “Toms Not For Resale”. It took me a few glances and a more carefully reading to understand what the boxes were trying to say. They were Toms shoes and the were meant “Not For Resale”. These were indeed the end of the supply chain from all those American and European malls where people buy Toms shoes at retail price and expect that one pair will be delivered to someone in need. I was actually seeing the result of that business model. Sadly, I would be returning to Steven’s office many times before experiencing the shoes being used. Steven is the department officer of Social Welfare. He has a few office staff and all of them have field duties in addition to what they must do in the officer, mainly involving reporting. It was about a month of me asking Steven for updates before he was able to start handing out shoes to children. There was the one week where it looked like we were going to go out to visit the schools, but the volunteer from Best Generation Community Foundation (the Ghana organization that was actually coordinating the distribution of shoes along with local government officers) was unable to make it up from Accra. So, again we waited. Luckily, Steven was able to make some progress working by himself. He visited the various schools and tabulated lists of needy children. Then the next week there was an issue getting a vehicle. Like many smaller, newly decentralized departments, Social Welfare doesn’t actually have its own means of transportation. You can only imagine the frustration this causes when you need to visit a village an hours drive away. But I digress. In the end, we were able to get a vehicle and all the volunteers were in town. Everything was in order. 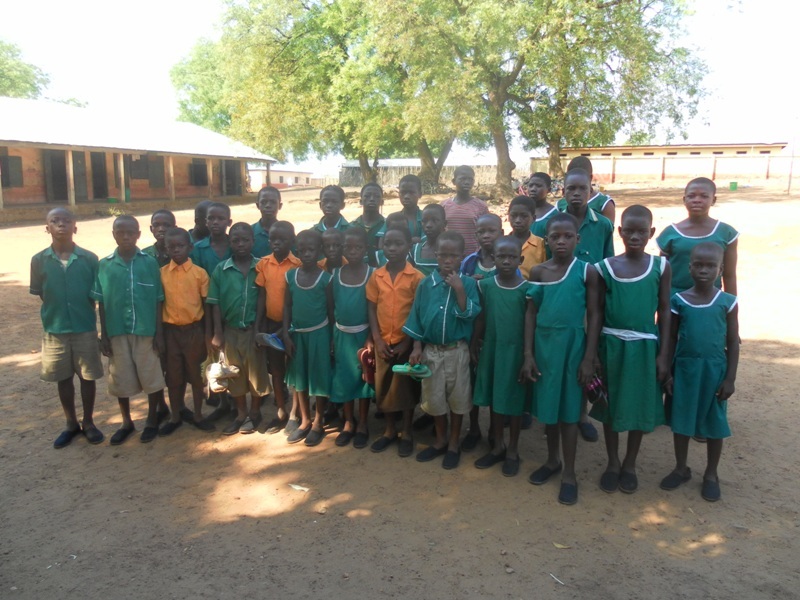 First stop, St Kizito A Primary School – one of the many primary schools found within Bole. Here, 24 children would be receiving a brand new pair of black Toms shoes. For some, it would be their first pair of new shoes. For others, it would be their first pair, period. Only a few minutes drive from the District Assembly, we arrived at St Kizito during the perfect time – during class. The students about to receive their donation were already pulled out from class and could be interviewed without any interruption from fellow classmates. Although many were curious and watching from inside the school quarters. Children fell into three general groups: those with new-ish footwear, mainly bathroom sandals and one or two with actually sneakers; those with bathroom sandals that were cracked or missing a piece; and those with nothing, bare footed. The children provided their names and stood for some stereotypical “before” photos. Then the boxes were offloaded from the rear of our truck, ready for handout. Chooses sizes posed a difficult challenge, as most children had no idea what size of feet they had. So, round and round, the “try it on and see if they fits” attempts went. All in all, it went pretty smoothly. This was the first attempt for everyone involved, seemingly. After the school visit, I was returned to the office. But the group of volunteers and government officers continued on to Sonyo Primary and one other school for more distributions. In the end, they handed over more than 300 pairs of shoes that day. Here are some other children who received a bit of happiness that day. During the short ride I had with the volunteer from Best Generation, he was able to provide a few additional facts. 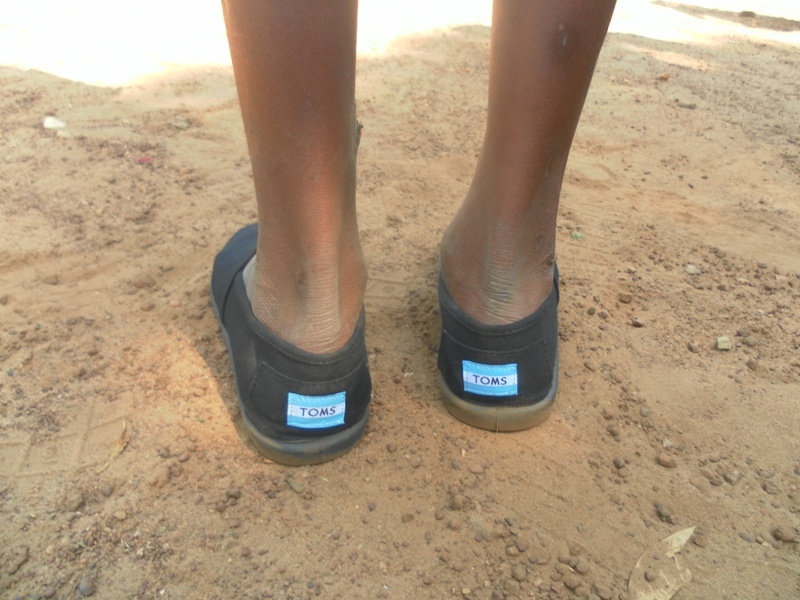 Not only was Bole District receiving 1,000 pairs of Toms shoes, but so were many other Districts. 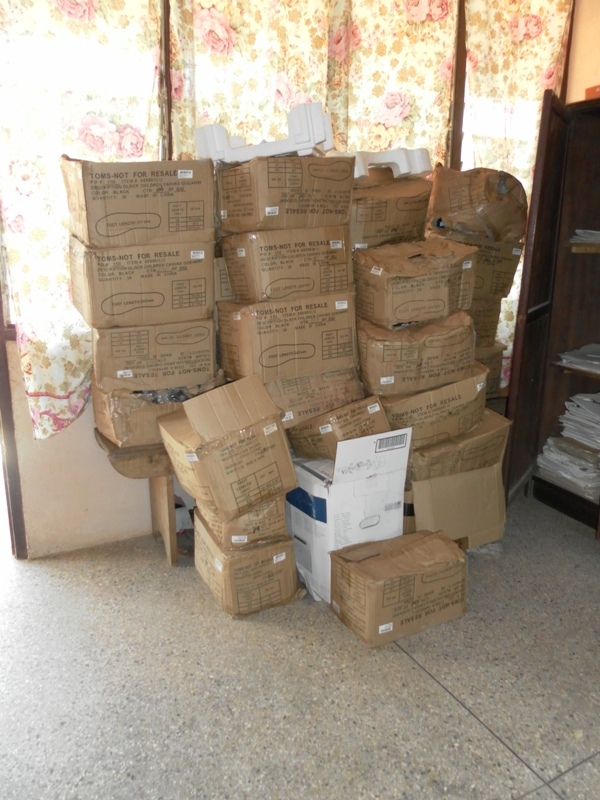 This was the first round of donations from Toms in Ghana. Although they would be returning in 6 months, and presumably, on a continuing basis, both me and Steven questioned whether the proposed plan of giving these same children another, slightly larger pair of shoes was the best tactic. They might hand over their old pair to a sibling or friend, but from the visits Steven went on, there was an astounding need for shoes. How about the children that will receive nothing and continue to walk bare foot? I encourage any readers to not just go out and buy a pair of Toms shoes because of this post, but to question the reasons why children across the world are unable to afford such basic necessities, like footwear.